Full movie can be viewed below. In the light of the AAAS announcing the discovery of the Higgs particle as scientific breakthrough of the year and as a holiday treat, this is the movie Decay. 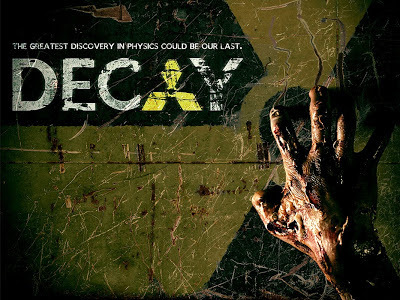 Decay is a horror thriller made by PhD Students at CERN. It is set in the Large Hadron Collider at the CERN facility. The premise is simple, a radiation leak from the Large Hadron Collider turns people into zombies. TO quote the line from the movie poster, "The greatest discovery in physics could be our last...". It's a zombie movie made by physicists. Incorporating the discovery of the Higgs Boson in the storyline will certainly appeal to all science and physics buffs around, especially with the Large Hadron Collider as the backdrop. There are no wild scientific theories in this movie. It's a simple radiation-leak-turns-people-into-zombies premise. That said, it has a decent storyline and the characters are pretty smart in the way the adapt to the situation (since they are physicists in real life!). As for the performances, there's a reason actors aren't physicists and why physicists aren't actors. Performances are sub-par in some parts, but the star of the movie is the LHC. The film doesn't show much of it but knowing that it's the actual facility does give Decay points. The claustrophobic feel of the dark twisting tunnels alone give the film character. The budget of the movie was around £2000 with a regular cast and crew of only 20. They used makeshift props and borrowed cameras. Editing and post was done on a personal computer using Adobe Premiere Pro and After Effects. Decay will appeal to a certain niche. It does have a B-movie feel to it but the movie is distributed free for everyone and is embedded below. A quick note though, even if the movie was filmed at the LHC, this movie is not endorsed nor is it authorized by CERN. The film follows a small group of students (played by physicists) after a disastrous malfunction in the world’s biggest particle accelerator. As they try desperately to escape from the underground maintenance tunnels, they are hunted by the remains of a maintenance team, who have become less than human. With the recent coverage of the discovery of the Higgs boson at the LHC at CERN, the film appeals to a wide-ranging, science-savvy audience, as well as to zombie enthusiasts as a new approach to the genre. Creative Commons is a growing and innovative culture, and this adds to the film’s appeal. CERN is the European Organisation for Nuclear Research and is the world’s largest particle physics laboratory, employing around 4000 international scientists and hosting many more visiting lecturers and guests. The Higgs boson is a sub-atomic particle thought to be responsible for giving other particles mass. There is absolutely no evidence that it is harmful in any way. CERN and the LHC have been enjoying much media attention in the last few years, and physics is very much in vogue thanks to popular figures such as Brian Cox.